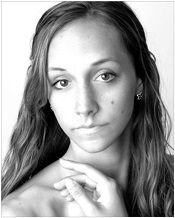 Anna Schmoker began her ballet training at VBTS in 1993 and studied under the instruction of Alex and Kirsten Nagiba. She attended North Carolina School of the Arts in the Ballet program, and went on to dance with Kansas City Ballet from 2008-2010. She graduated from the Institute of Culinary Education's Pastry Arts and Restaurant Management program in New York City in 2011 and worked as a pastry chef at Sugar and Plum in Paramus, New Jersey. After obtaining her certification as a registered Kripalu Yoga teacher from the Kripalu Center for Yoga and Health, she teaches yoga and ballet in Vermont while studying chemistry at the University of Vermont.